Transcription par E. Guiraud. Composed by Camille Saint-Saens (1835-1921). Edited by E. Guiraud. Editions Durand. Classical, Dance, Contemporary, French, Symphony, Duet. Book Only. Composed 2001. 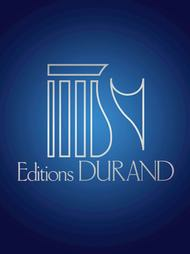 Editions Durand #DF 00214100. Published by Editions Durand (HL.50560161). Transcribed for 1 piano, 4 hands by E. Guiraud.